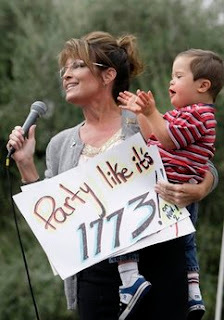 Sarah Palin will be heading to Madison, Wisconsin for the big Tax Day Rally on Saturday. Sarah is no stranger to Wisconsin politics as she endorsed Governor Scott Walker's successful election bid, and most recently backed Wisconsin Supreme Court Justice David Prosser in his successful re-election bid. She was also very vocal during the violent left wing protests over Governor Walker's attempts to save the state from bankruptcy. Sarah penned an open letter to her union brothers and sisters asking them to stand with Governor Walker and refudiate the union thug leadership and their violent rhetoric. This letter was then read aloud to a large and receptive crowd by Dave Westlake. Former Alaska governor and current tea party sweetheart Sarah Palin is coming to town Saturday to help rally the GOP troops for the now-annual Tax Day Rally. Event organizer Nancy Mistele confirmed the presence of the Mama Grizzly Thursday. She said more details would come out later in the day. Organizers are planning the event to run from noon to 2 p.m. at the state Capitol. It's expected to be a gathering of conservative activists from around the state. Other speakers include radio personality Vicki McKenna, Wall Street Journal columnist John Fund, talk show host John T. Harris, and Americans for Prosperity State Director Matt Seaholm. Americans for Prosperity is organizing buses to the event. "Governor Palin is a strong voice for taxpayers and for reforming government to make it more accountable," Seaholm said. "She doesn't pull punches and is one of the most influential and followed commentators in politics today." And Northwoods Patriots founder Kim Simac, who is also speaking at the rally, called Palin a "huge role model." Madison tea party activist Kirsten Lombard is going to be out of town Saturday, but she said most of her fellow tea partiers will be in attendance. "I think (Palin) will certainly energize the conservative base in Wisconsin," she said. Democratic Party of Wisconsin Chairman Mike Tate said Palin was an early supporter of Scott Walker so it makes sense she would come to Wisconsin. MADISON, WI - Former Vice Presidential candidate Sarah Palin will deliver the keynote address at the Madison Tea Party. On Saturday, April 16th, Governor Palin will rally tea party patriots from throughout Wisconsin at the state Capitol in Madison to celebrate past victories and to protect Wisconsin's future. Joining Governor Palin will be talk show host James T. Harris and John Fund columnist for The Wall Street Journal. Fund is an author, pundit and columnist who pens the weekly "On the Trail" column for OpinionJournal.com. The Wisconsin State Director of Americans for Prosperity, Matt Seaholm, says he is excited Governor Palin will be attending the tea party on Saturday. "Governor Palin is a strong voice for taxpayers and for reforming government to make it more accountable," Seaholm said, "She doesn't pull punches and is one of the most influential and followed commentators in politics today." The Founders Compass is an online resource for tea party members to organize, inform and reach out to other patriots. Additional information on the event can be found at TEA Party rally on April 16th on Facebook. Registration and transportation can be found by visiting the website of Americans for Prosperity Wisconsin.